Our One-Pan Pasta with Chickpeas, Olives and Parmesan recipe is a delicious one-pan vegetarian pasta that’s super easy to make. We prepared ours with gemelli pasta, but you can use fusilli, penne or farfalle with equally great results. 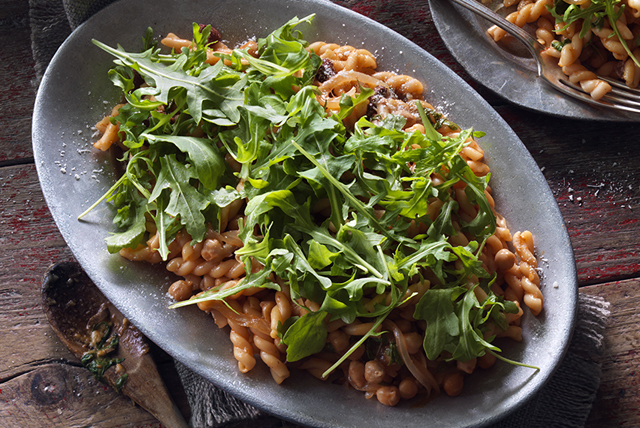 Combine all ingredients except cheese and arugula in Dutch oven or large deep skillet. Bring to boil on medium-high heat; cook on medium heat 12 to 15 min. or until pasta is tender and liquid is reduced to a sauce thick enough to coat remaining ingredients, stirring occasionally. Remove pan from heat. Carefully remove and discard basil. Add cheese and half the arugula to pasta mixture; mix well. Top with remaining arugula. Serve with a fresh green salad tossed with your favourite Kraft Dressing. Meatless mains can provide you with great nutrients! The combination of the chickpeas and enriched pasta make this dish very high in fibre and an excellent source of iron.